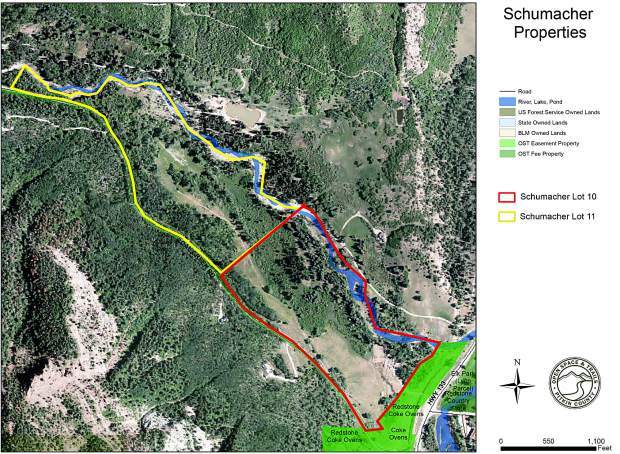 Pitkin County Open Space and Trails and the county’s Healthy Rivers and Streams Board are seeking to purchase about 70 acres along Coal Creek, near Redstone, which could facilitate cleanup of the Crystal River. County commissioners will take up the $1.8 million purchase Wednesday, when an ordinance authorizing the purchase is scheduled for the first of two readings. The Open Space and Trails Board is scheduled to take action Thursday. The property, consisting of two side-by-side, 35-acre parcels, borders the county’s Redstone Coke Ovens property to the southeast. Coal Creek meanders in and out of the property’s northern border for about a mile. The Healthy Rivers and Streams Board will contribute $250,000 toward the purchase with the goal of then financing a water-quality enhancement project along Coal Creek, just above its confluence with the Crystal. Coal Creek pours out of Coal Basin, formerly the site of extensive coal mining operations. It’s possible that the property could be utilized to filter out sediment from Coal Creek before it enters the Crystal River, particularly during spring runoff, said John Ely, the county’s attorney and its staff liaison to the Healthy Rivers and Streams Board, in a statement Monday. “It might be the best, and perhaps the last, opportunity to address sediment load dumped out of Coal Basin into the Crystal,” Ely said. Avalanche Outfitters at Redstone Stables currently operates from the property through a lease arrangement. The property was previously used for a modest nordic ski system. Following the purchase, the Open Space and Healthy Rivers programs would work cooperatively on an inventory of natural resources to determine the ongoing uses, according to Dale Will, Open Space and Trails executive director. The land is roughly divided between irrigated meadows and native forested areas, offering recreational, wildlife and agricultural access and scenic views, Will said in the statement. The purchase would include significant water rights in the Beaman Ditch. The property would be named Schumacher Open Space in recognition of the sellers of the land.